Mark Thursday 8th October in your calendar and start offering or buying locally-grown vegetables, fruit and eggs. 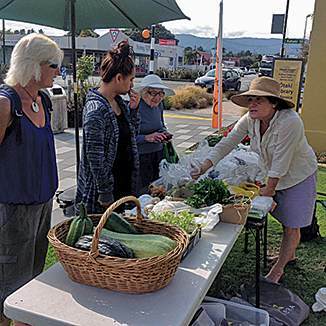 This is the seventh season Ōtaki’s Sustainable Food Group has opened its stall, proving this is a popular move towards a more self-sufficient community. “It’s an ideal opportunity for home gardeners to share their extra produce with the community,” says Bernadine Bloemgarten, one of the group’s initiators. Produce is bought at 80% of the price at which it will be sold. The other 20% goes to cover expenses in setting up and running the stall. Any excess produce, or profit over and above expenses, is given to local community groups. The stall operates every Thursday, on the green area by the Council building in Main Street, Ōtaki, from 11am till 12 noon, or until sold out. Growers should bring their garden surplus to the stall between 10.30am and 11am.